JNTUK Syllabus: JNTU Kakinada syllabus books for R16, R13 Regulations. Download the R16 regulation b.tech syllabus books, r13 regulation syllabus books, m.tech, mca, mba, b.pharmacy, m.pharmacy syllabus books pdf. Students who are having Interested to know about their Academic Syllabus can download their JNTUK Syllabus Books PDF so that, they can get the overview of their Examination Syllabus to be covered for each semester. Here we are providing the clear information about each subject and their sub units along with the topics should be covered in that unit. For various branches separately almost 18 branches under who are studying JNTUK. 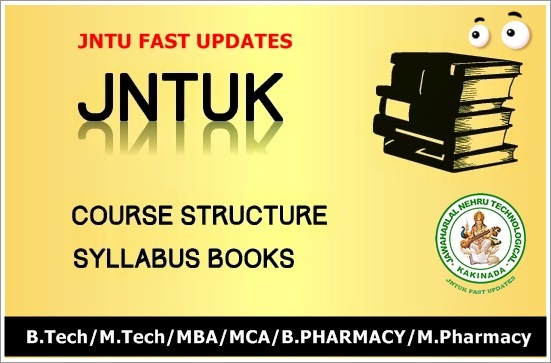 Candidates who are pursuing B.Tech, MBA, MCA, M.Tech, B.Pharmacy, M.Pharmacy under JNTUK can download the Academic Syllabus from the below links which we were provided to you. It gives the complete information about Subjects and the portions to be covered with the span of time along with the lab practicals. Here we are providing JNTU kakinada B.Tech, B.Pharmacy, MBA, MCA, M.Tech, M.Pharmacy syllabus books In Single page For R16, R13, R10 Regulation Students. You can simply download the respective syllabus books from below links. If you have any queries or any link not working, feel free to add your comments below. Syllabus Books for Aeronautical Engineering (AE), Civil Engineering (CE), Computer Science & Engineering (CSE), Computer Science & Systems Engineering (CSS), Electronics & Control Engineering, Electronics and Communications Engineering (ECE), Electronics and Computer Engineering, Electronics and Instrumentation Engineering, Information Technology (IT), Mechanical Engineering (MECH), Mechanical Engineering (Mechatronics), Bachelor of Pharmacy, Pharma D, Master of Business Administration (MBA), Master of Computer Applications(MCA), M.Tech, M.Pharmacy and other Courses/Branches.